A Basic, Quaint Cottage, (plus A 'Crows Nest') In The Family For Generations. Also, a BBQ, Washer/Dryer, wifi internet access, beach toys, umbrellas, kayaks, boogie boards, and some bicycles....etc. The Brown family siblings inherited this home in 2013 from their loving parents. It has been a family home for generations and remains filled with mementos. Steps to the water, and a short walk to three different beaches. A large backyard for outdoor activities, Wicker rockers on the porch for water views. 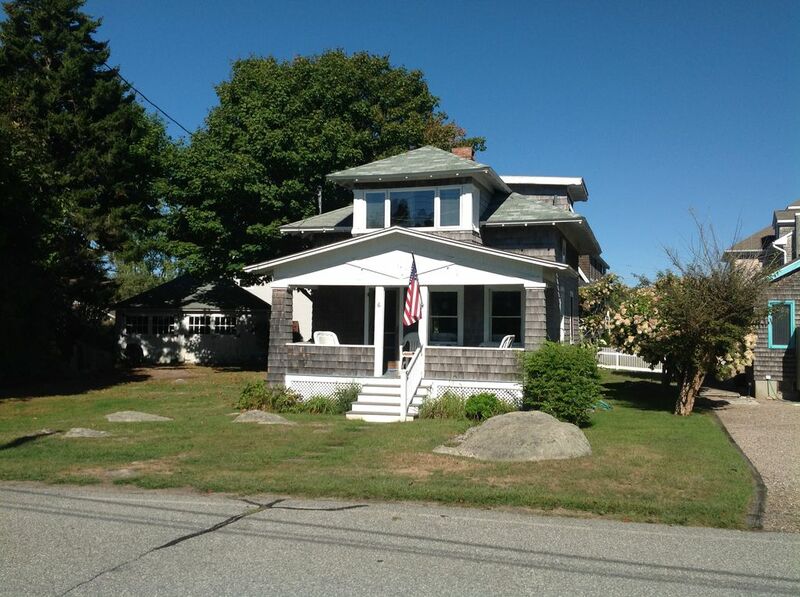 This cottage retains its original character as a Groton Long Point beach cottage. Two houses towards the water and 40 steps along the waterfront sidewalk takes you to 'Baby Beach' with soft sand and calm waters for swimming, kayaking, etc. 60 steps from Long Island Sound, and pleasant views of the water from the house. Very nice swimming , clamming , kayaking, rowing, sailing, etc. There are two new window air conditioners upstairs, and fans available to move air downstairs if the weather is 'super hot'. The home is not winterized, but there is an oil fired furnace to take the chill off early and late season mornings. Off street parking for about 4 cars on the property. Beach towels and Bath Towels are provided. A variety of kids games are available. Very large backyard for croquet, bocci, and family games. Outside hot water shower for after beach. Two basic single person fibreglass kayaks are provided. or bring your own and launch it just a short walk down the street to the beach. A couple of newer and a few older bikes. If you are into it - bring yours. Umbrellas. boogie boards, beach chairs, beach towels, are available at the cottage. Many choices within 20 minutes. Contact us by email and we will get back to you promptly to verify availability. Please provide your name, phone number, dates you are interested in, and number of guests. This is a non-smoking rental. Cozy, warm and welcoming cottage within walking distance to the shore. We were there during the off season so it was very quiet. Cottage is older mixed with New England charm and some more modern decor. My kids enjoyed the upstairs bedroom with the crows nest. Bikes and Kayaks are available to use. The beach was great! Very shallow so it is great for small children. Just a short walk from the cottage. Thanks for the nice review. Your perspective is valued. Don and his brother Eric were both prompt, friendly and highly responsive to our questions and needs. A party of 3, we were very comfortable and enjoyed the homey feel of the house, quiet neighborhood, and proximity to the water. It was a great launch pad from which to explore small towns along the coast, parks and fall festivals in central Connecticut, and a day trip up to Providence. It took a minute to find the kitchenware in the dining room closet and the heater rattles when you first turn it on, but that is normal. There were plenty of extra blankets and fans, if needed. If it had been warmer, the kayaks and beach chairs would have definitely been in use! However, it was a wonderful place to enjoy early fall. Great beach access and beautiful views!! Property is exactly as described, a rustic beach house. Filled the bill for us. Could be a bit more organized and with a bit less clutter. Sometimes difficult to access things. The cottage was perfect for myself and my husband, although it would be ideal for a small family. It has a very nice large yard, and many amenities; bikes, kayaks, and beach chairs. The kitchen was well stocked with everything you need to prepare meals. We booked this cottage in September, it was quiet and relaxing sitting on the front porch. This home was also dog friendly which was a plus for us. This was our second visit to the Rest Nook. This cottage has everything you need for a week at the beach. I love that this place reminds me of what the homes looked like at GLP when I came as a kid. The use of their bikes, kayaks and mooring puts it over the top for us. Great location. Thanks for a fun week. Thanks for the kind words. Glad you enjoyed the cottage. See you again soon! This was our first time staying on the CT coast and we weren't sure what to expect but we were pleasantly surprised. GLP is a place where kids disappear for the day riding their bikes or playing on the beach, showing up back at home when hunger calls or they need money for ice cream. People leave their beach chairs and kayaks at the beach instead of dragging them back and forth each day because it's that kind of family place. This quaint cottage is rustic, basic, clean, and comfy. We enjoyed hanging on the front porch with a cup of tea in the morning or a glass of wine in the evening. The house had 2 kayaks that my kids (in their 20s) made good use of. There is a tiny beach 3 houses away that was perfect for taking the boats out. The water is shallow so it's safe for even little kids. We went out and bought a few blow-ups (and a pump) which were also fun for the calm water. It's a short drive to the "big beach." You could walk or ride your bike but it's easier to drive if you're bringing a chair. There are a few bikes (bike riding is big on GPL) available to use but only 2 worked and then the chain broke on one. I let Eric know and he brought over a new bike and fixed the chain. The house had plenty of dishes, flatware, and glasses which is great because don't like to use a lot of disposables. There is no dishwasher but washing dishes don't bother me. Sheets and towels were provided and a big washer and dryer are available if you need to do laundry. There was soft soap in both bathrooms, laundry detergent with the w/d, and dish soap in the kitchen. I brought paper towels and toilet paper but there was some in the house already and we did end up breaking into our supply. One of the reviews mentioned spices but I only saw salt and pepper. I always bring my own spices (and knives) anyway because I love to cook. I would have liked the pots and kitchen stuff to be better organized in the kitchen cabinet. Everything was just piled on top of each other, it needed shelves. There is a new half bath off the laundry area which was really convenient for changing. There is a little shower on the side of the house, it's right out in the open and not private but good for rinsing off sand. Sleeping was a little tight for 6 adults because one of the beds is a double and the futon in the nook is small but we worked it out and had a wonderful time. When you tire of the beach, Mystic is minutes away with lots of things to do and places to eat. CLOSE TO ALL MYSTIC AREA ATTRACTIONS -- Seaport -- Aquarium -- Old Mystick Village -- Downtown Mystic -- Ford's Lobster Shack --Noank -- Clydes Cider Mill -- New London Submarine Base -- Nautilus Submarine Museum -- U.S. Coast Guard Academy -- Mohegan Sun Casino -- Foxwoods Casino -- Pequot Historical Museum -- and lots of shopping! Check in time is 3:00 pm, check out time is 11:00 am.